Fig trees will die back to the ground without winter protection. According to New Mexico State University's website, fig trees that are shielded from winter weather will produce fruit on the older stems. Covering fig trees will entail, at the bare minimum, an insulated tree blanket. These blankets are found at most home garden stores in the fall of the year. Covering of the fig tree must be done after all leaves have fallen from the upper limbs. Construct a round cage from an 18-foot piece of 4-feet high woven wire fencing. Tie the two ends of the fencing together using the pliers. Slip the 5-foot diameter cage over the fig tree, once all leaves have fallen from the upper limbs. Fill the interior of the wire cage with leaves raked from your yard. Press down on the leaves to lightly pack them around the fig tree limbs. Continue until the leaves reach the upper wires of the cage. Cover the cage with the insulated blanket or heavy tarp. Lay a couple of old boards over the top of the cover. This will weigh the cover down to the cage. Place a few more boards around the outside of the cage, on top of the tarp, to hold the cover to the ground. 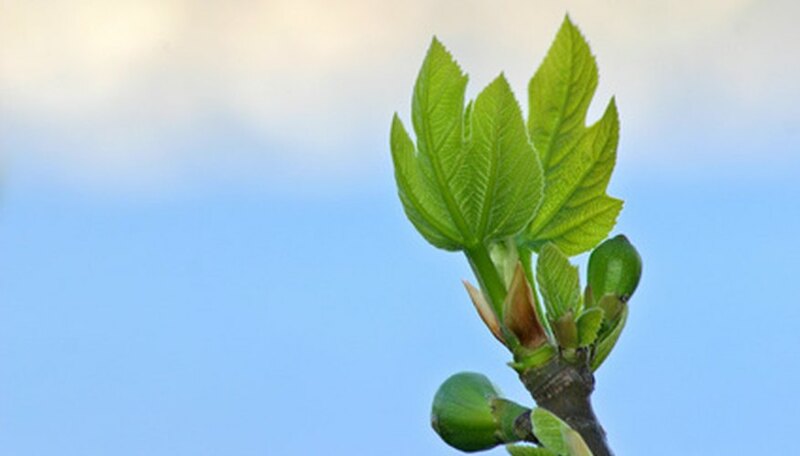 Inspect the fig tree in early spring for signs of growth. Remove the cover, leaves and cage immediately when all danger of frost has ceased from your location. If no leaves are available, one bale of wheat straw can be used as a substitute. Break open the bale. Break the individual bricks of straw apart. Loosely place the straw around the fig tree. Planting fig trees on the south side of buildings will reduce the risk of winter freezing. Pruning back all dead wood from the fig trees upper limbs will reduce exposure to the cold weather.